The exhibit includes abstract and impressionistic landscapes in oil and watercolor. Art show Sarasota, FL. 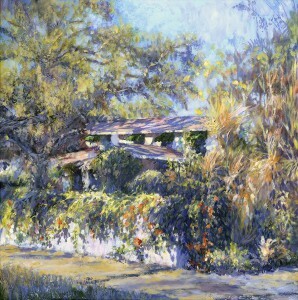 “Paradise in Season: New Works by Beverly A. Smith, Vladislav Yeliseyev and Joseph Palmerio” runs March 14 through April 30 at the Celery Barn in Towles Court, 266 South Links Avenue, Sarasota. The exhibit includes abstract and impressionistic landscapes in oil and watercolor. The artists who represent themselves in this show will be available on opening weekend March 14-15, 10 – 6 pm with a life painting demonstration by Vladislav Yeliseyev on March 15 at 2 p.m. A reception, with artists, is March 21, 6-9 p.m. Gallery hours are Tuesday-Saturday, noon-4 p.m. For more information, call 941-330-6865. Beverly A. Smith has been a teacher, coach, mother, exercise physiologist but now devotes most of her time to creating art. “My expressionistic work is intuitive,” says Smith. “As I add more paint, movement, shape and texture to the work, it develops itself and becomes a painting. The experience is not a deliberate, intellectual one—but a journey, from beginning to end. I enter the painting feeling like climbing in and tiptoeing around. This is how I get the depth in my work by experiencing it first hand. I become part of the painting.” Smith says she’s been continuing her studies at the Renaissance School of Art in Sarasota, where she’s concentrating on anatomy and figure drawing. She also studies at The Southern Atelier in Bradenton. The works in this exhibit will be abstract expressionist and impressionistic landscapes in oil. For more information about Smith, visit www.beverlyasmith.com. Joseph Palmerio is a graduate of the Pennsylvania Academy of Fine Arts, and the Barnes Foundation in Philadelphia Pa. His work is part of numerous private collections throughout the country, including the Coville collection in Sarasota, the Grant collection in Reston Va., and the Havard collection in Philadelphia. Palmerio has exhibited in the Coutts Museum in Kansas as one of the top “100 National Parks Artists,” and has completed large murals for the city of Philadelphia, the Acme Market Corporation in Great Valley, Pa., and Motivation Inc. in the Orlando Airport. Palmerio has served as artist-in-residence for the Everglades National Park and the Great Sand Dunes National Park in Colorado. He teaches painting and plein air techniques privately and holds workshops up and down the east coast. Palmerio will exhibit butterfly abstractions and landscapes in this show. For more information, visit www.palmerioart.com.